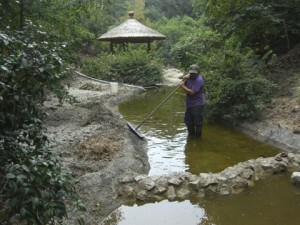 It is our philosophy when we build any water feature, to create it with ease of maintenance and sustainability in mind. Quite often we are called in for the restoration and repair of existing water features. We can get old fountains running or breath new life into existing ponds. It is important to properly maintain your water garden in order to keep it looking beautiful throughout the year. Our team of experts is experienced in doing just that. Ponds are living growing entities and will need tending to on a regular basis. We have the tools and experience to do just that. We offer on-going maintenance plans on a weekly, monthly or seasonal basis. We will work with you to determine the exact requirements of your water feature.